Getting this up a little late, but I have a good reason. I was at the New York Transit Museum’s third annual Transit Trivia night, trying to help my team defend its second-place finish last year. That happened to be the same night Arthur Chu tied, and the rest is history. Nothing quite that exciting Wednesday. 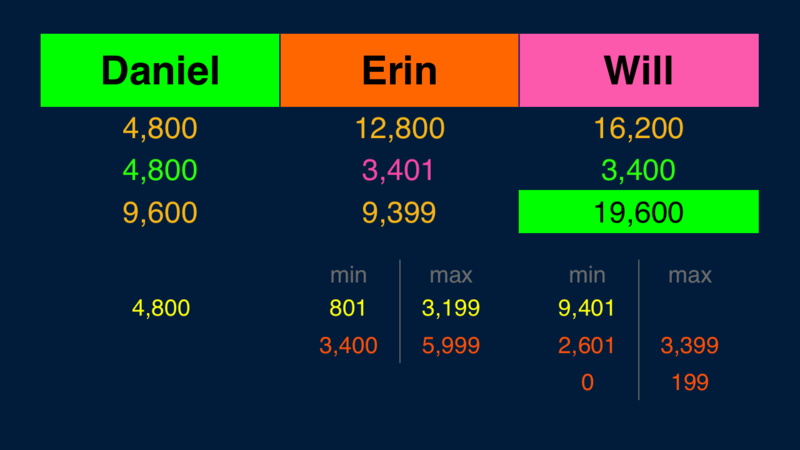 If Erin doubles her score, she’ll have 25,600. 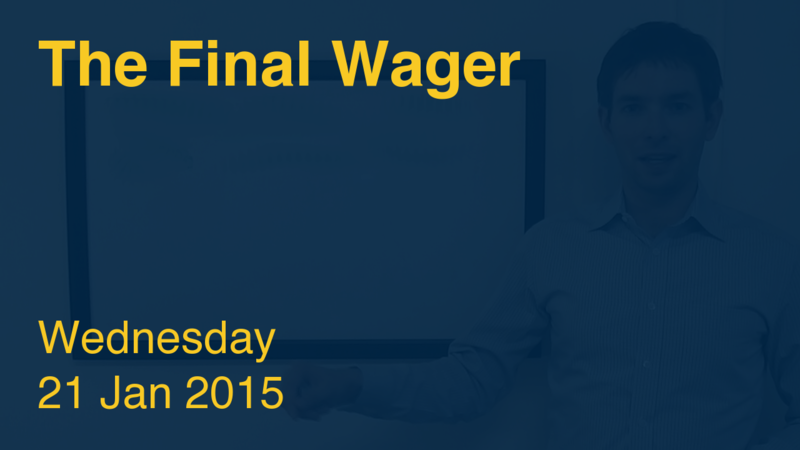 To cover this all-in wager, Will will need to wager 9,400. An incorrect response with that wager will leave Will with 6,800. To stay above his total, Erin can wager up to 6,000. Daniel must respond correctly to have a shot, so all-in is the way to go. A successful doubling will put Daniel at 9,600. To stay above him, Erin can wager at most 3,200. Will could wager at most 6,600. 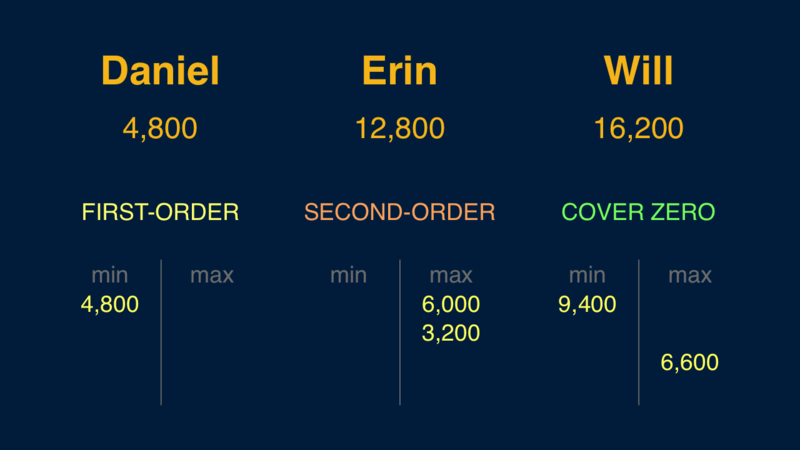 If Erin chooses to stay above a double-up by Daniel, she will have at most 16,000. Will can stay above that total by wagering no more than 200. If Erin makes the rational maximum wager of 6,000, Will will need to wager 2,600 to cover her. If he’s wrong with that wager, he’ll be left with 13,600. In that case, Erin would have to wager 800 and respond correctly. We take into account the difference between Erin and Will. I don’t like the risk Will takes here – going for the tie. 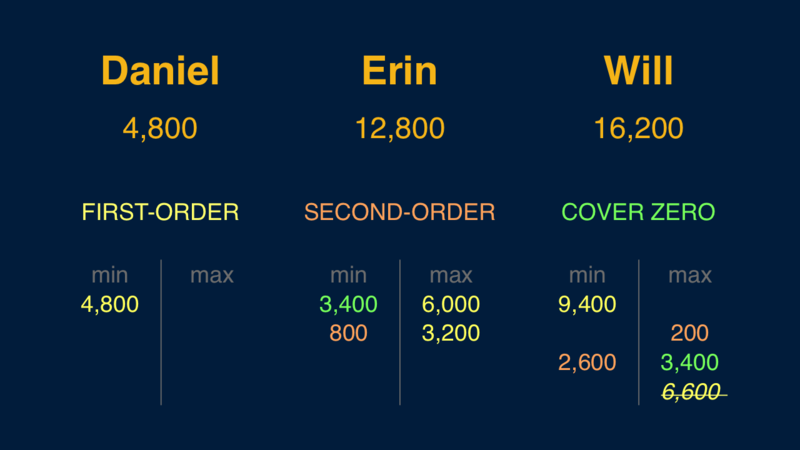 I’m not sure that this qualifies as a “Shore’s Conjecture” situation, since Erin can’t safely make a wager to cover a zero wager by Will without falling below Daniel, should he double up. Just my observation. You are absolutely right. Thanks for catching that! KOMO never did broadcast the show. They just pretended it never happened. Oh well. In the last 10 regular games (counting tonight) in which we had three players in Final Jeopardy we have the following result: In 1 case all three got it right = easy. 3 cases of 1 right + 3 cases of 2 right = 6 ok and 3 cases of 0 right = hard. So that’s a “final jeopardy degree of difficulty = just right” score of 60%. The “average degree of difficulty” score (higher is harder) stays at 1.80. No triple stumper today so the “no triple stumper on FJ” streak now stands at 2 days.